We have a great range of sealing products for your pavers, retaining walls and natural stone to keep it looking as good as new. Why Seal Stone or Tiles? Natural stone and tiles are porous by nature. If you want to protect your investment, we highly recommend sealing. Sealing prevents and reduces dis-colouration and staining that will occur overtime. Prevention is always better than cure. Keep your new investment looking good by always seal your pavers, tiles or retaining walls with an effective sealer . 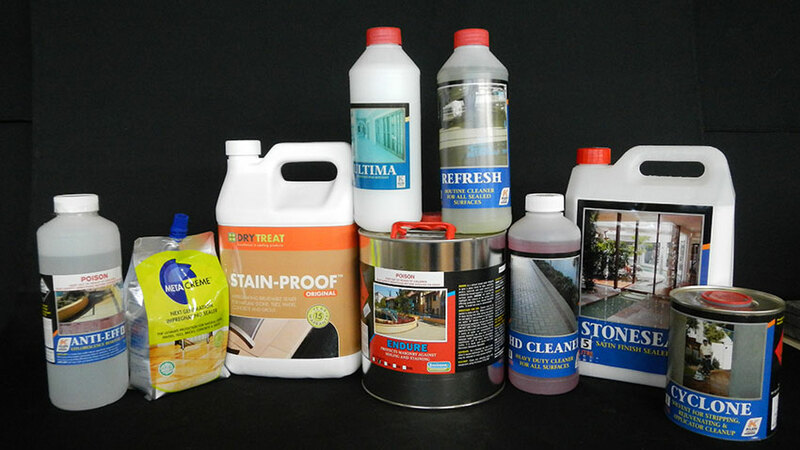 Dry-Treat sealers provide superior protection. Super oil and water repellence equates to superior stain protection. Deeper penetration and permanent bonding equates to permanent PLUS premium protection from efflorescence, salt spalling, freeze-thaw spalling and picture framing. For indoor and outdoor use on residential and commercial projects on floors, patios, entertaining areas, facades, cladding, pool surrounds and walls. The penetrating sealers even stand up to commercial cleaning techniques e.g. high pressure hosing and maintain the slip resistance of the surface.